To consult the data and the documentation, you need to be registered and logged in. 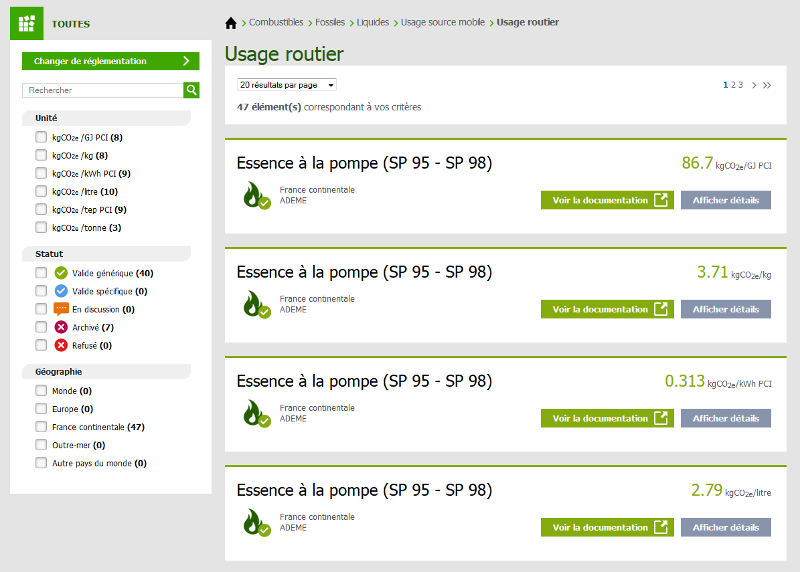 To be able to download the data, you also need a "pro-pack" or "internal pack" license. Or, select "regulatory filters > article 75 Grenelle II Act", which will give you access to the factors for scopes 1 and 2. Furthermore, only the combustion part will be selected for fuels. 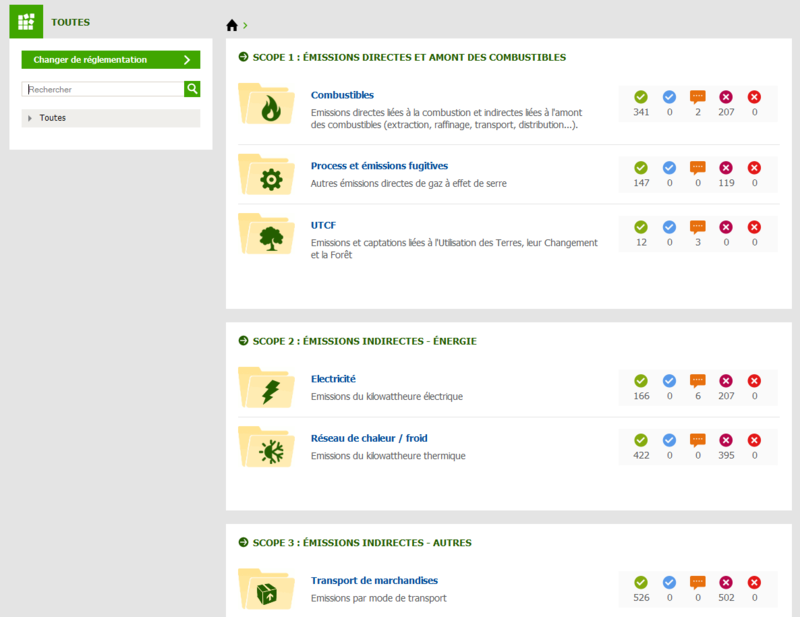 If your consultation is in the framework of article L1431-3 of the French Code of Transport relating to CO2 information for transport services, select mode: "article L1341-3 of the Code of Transport". If your consultation is for any other reason, select the mode: "all data > all". If you have chosen a regulatory filter, the screen is similar but there are fewer categories. Either, you can search by "tag", by entering a keyword in the top-left data entry field. This solution offers you a quick way of finding what you are looking for, but requires you to have already used the application a little in order to understand what type of item you might find. Or, you can search by category, by clicking on one of the files. Keep clicking on the files until you obtain a list of results. The explanation of this tree structure per category is detailed on the categories page. Note: if you are not consulting in the framework of the implementation of a GHG inventory, do not worry about the terminology (scope 1, scope 2, scope 3). Once your keyword has been entered, or your search per category throws up no more files, you will arrive at a list of results. To quickly find the item of interest to you without searching through the 47 items, you can check filters to limit the number of results returned. The status filter corresponds to the state of validity of the item. For more information about this, see the status page. The geography filter corresponds to the geographical zone for which the item may be used. If your carbon accounting exercise is for continental France (metropolitan France excluding Corsica), you can use the items with the geographical scope: "continental France", "Europe" or "World". Note: sometimes you may find the same item with both "Europe" scope and "continental France" scope. If the activity that you are studying is purely national, select the items with the "continental France" scope. If, on the other hand, it concerns a multinational activity, select the items with the "Europe" scope. The unit filter allows you to choose the unit for the item. 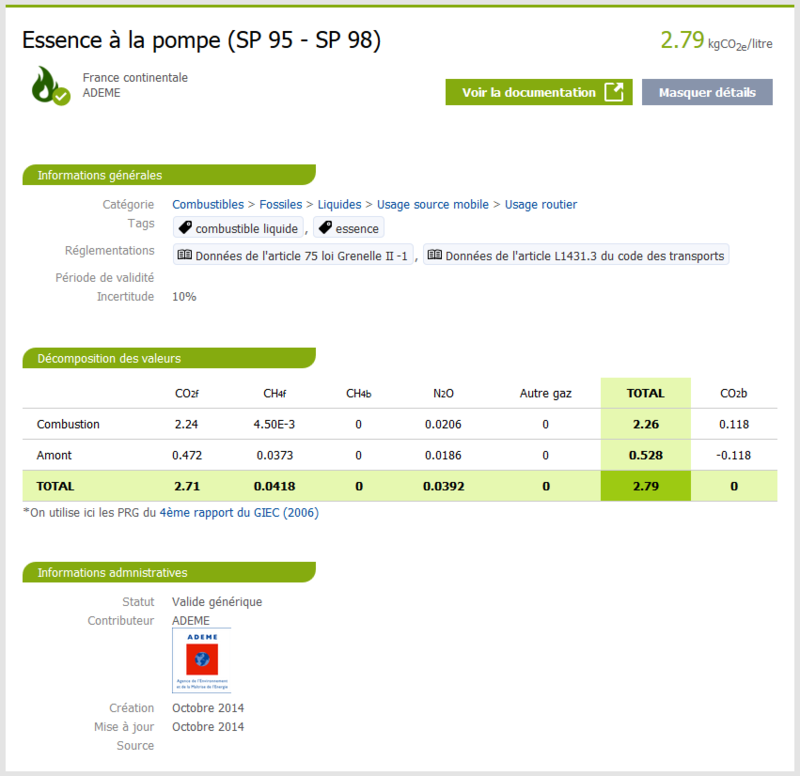 item name: here, "gasoline - road (pump)"
value and unit: here, "2.79 kgCO2e / liter"
geographical scope of item: here, "continental France"
name of organization that proposed the data: here, "ADEME"
Next, the table of values broken down per gas and per emission category. Note: Certain items are not broken down per gas. Others are not broken down per emission category. If an item is not broken down either by gas or by emission category, there is no table of values. Here, for example, we can see that the combustion of one liter of gasoline generates 2.23 kg of CO2 in exhaust emissions; or 2.26 kg of CO2e (equivalent CO2) if we take account of the parasite emissions of CH4 and N2O linked to the incomplete combustion of the gasoline. We can also see that the upstream phase (extraction, refining, transport and distribution) for this liter of gasoline will have generated 0.528 kg of CO2e. You should now have all the keys to enable you to consult online items. If you have any questions relating to these, please feel free to ask your questions on the forum (available from February 2015). If you subscribe to an "internal pack" or "pro pack" license, you can download the data in CSV format for use in your tool. Likewise, you can download the associated documentation. The data and the documentation are versioned. The CSV file contains the same data as the online consultation module. An item is represented there on one or more lines. If this concerns an item that is not broken down per emission category, it is represented on one line. If it is broken down per emission category, it is represented on several lines. 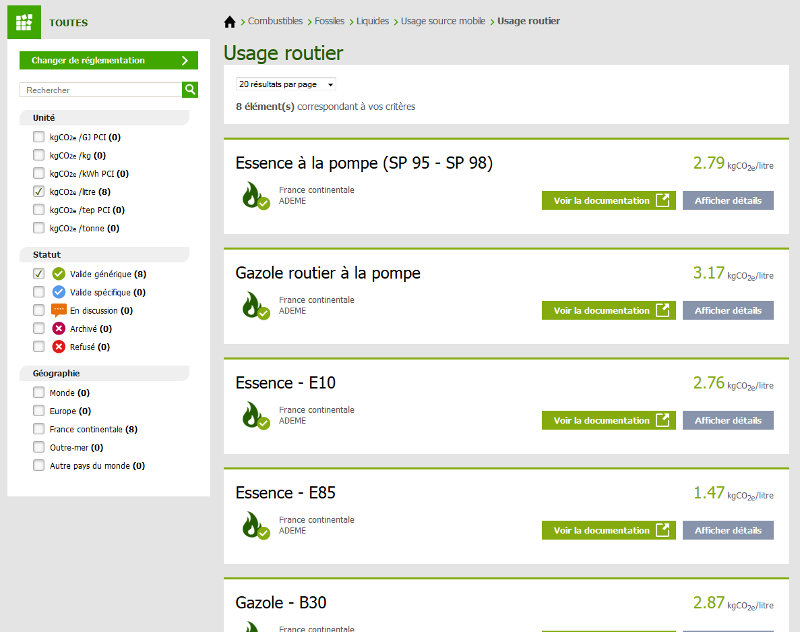 In this case, in column A of the CSV file it is stated as "Item" ("Elément" in French) for the TOTAL line of the item and, below, "Category" ("Poste" in French) for all the emission categories of the item. The "gasoline" item above is therefore represented on three lines: one TOTAL "item" line, and two "categories" lines. The other columns of the file are fairly intuitive. If you are using Excel, we recommend that you apply a filter to the first line in order to browse through more easily the many lines of this file.